1. With so much nature in our area, what types of outdoor adventure do you participate in and where? Pete: I like to hunt and fish. With Lake Winnebago and the Kettle Moraine close by along with Lakeside Park, these are all great places to go. Deb: In the winter we love to go the Sturgeon Spectacular, snowshoe at Kiekhaefer Park, Lakeside Park and in the back of our house around the pond by the Fond du Lac Loop bike trail. 2. Where would you go in Fond du Lac or the Lake Winnebago Region for your favorite beverage (adult, blended, etc.?) What would that beverage be and why? Pete: With so many really good restaurants and bars in the area, I would go to the Green Dragon for a Bloody Mary. Of course, the search is the best part! Deb: One of our favorite places to go to is Sunset on the Water Grill & Bar on a warm, summer night. 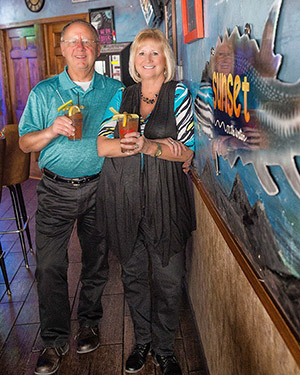 They have a beautiful outdoor patio where you can enjoy your favorite beverage, Rum & Coke or a Bloody Mary and watch the amazing sunset over Lake Winnebago. 3. What is your favorite way to spend a day with the family Fond du Lac or the Lake Winnebago Region and why? Pete: A quiet day in Lakeside Park fishing with the family is a favorite of mine. The scenery is so beautiful, the atmosphere in the park is very relaxing and dinner is bound to be delicious! Deb: Our family loves doing simple things like taking a picnic lunch out to Lakeside Park, spreading out our blanket and spending quality time fishing together. Pete: With so many great places in the area, Sunset on the Water Grill & Bar is my go to place for great chicken wings and burgers. They have a great staff and an amazing outdoor patio overlooking Lake Winnebago. My next choice for a nice, quiet dinner along with the best barbecued ribs would be the Idlewile Inn in St. Cloud. Deb: One of my favorite places to eat in Fond du Lac or the Lake Winnebago Region is Casa Del Tequila which has the traditional Mexican food that we LOVE! Their staff is very accommodating and the service is excellent.